Futurist-minded weirdos were dreaming up 3D movies as early as the 1910s, back when feature-length films were still in their infancy. 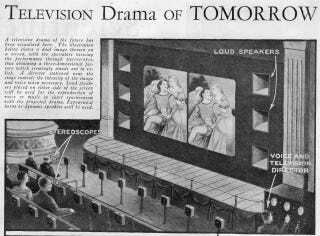 But in 1928 the hot new techno-hype was all about television: specifically, 3D TV that people could watch in a theater. Complete with that newfangled sync-sound! The December 1928 issue of Science and Invention magazine illustrated this far-out vision of the future, with the audience sitting behind "stereoscopes" — the 3D glasses of the early 20th century, mounted in front of each seat. Nobody really knew what TV tech would be used for at this point. The first public demo of TV had occurred in London just two years earlier, and live theater performances beamed to showhouses around the country seemed as plausible as anything else. As late as the mid-1930s, people were imagining that people would gather in large theaters to watch live news broadcasts or even rough nature documentaries, like the one below. People saw the home TV set as a possibility, or even a probability, but by no means was it seen as the only way to deliver the medium. The backstage view from Science and Invention is where we get to see how this operation really ticks. The rear-projection screen is flanked by rows of loudspeakers wired to amplifiers. A "stereo television projector" is running a mechanical TV set-up — an early type of TV technology that used a spinning disk with holes to project an image. The project was even going to be in color — or, as the magazine put it in 1928, "It is not too much to expect that the images will be seen in their natural colors." Again, remember that virtually every aspect of this was cutting edge tech for the time — possible technologies all mashed together into one wildly futuristic experience. Sound, broadcast TV, 3D and color? This was all sci-fi stuff at a time when the sci-fi movie in theaters was Metropolis (1927). Live TV would prove more useful in the home than the theater, but the very scene we see here in the pages of a 1920s tech mag is being played out fairly often in the early 21st century with live performances from The Met — albeit with more advanced live-TV technology. And sadly, no stereoscopic glasses. What a missed opera-tunity.